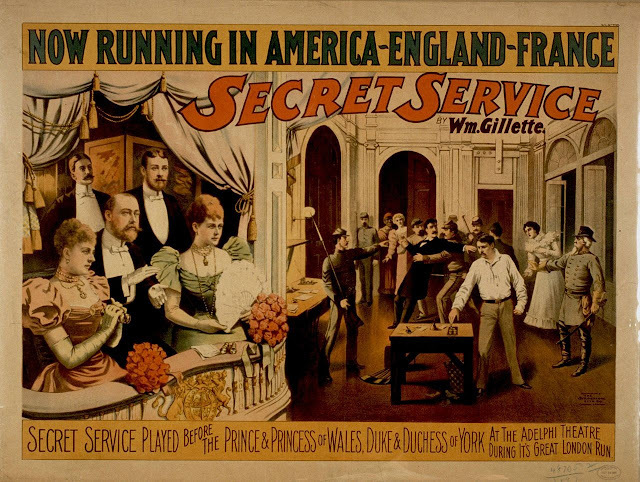 SHERLOCK HOLMES JOINS THE SECRET SERVICE --- How good was William Gillette as Sherlock Holmes? He might have been the all-time definitive one. Sir Arthur C. Doyle thought so, but then, of course, he didn't live to see Robert Downey Jr. enact the role (only half-kidding here, as I think Downey is a terrific modern Holmes). Author and actor buddied up and stayed close for a rest of lifetimes. We who watched Basil Rathbone on loop-served syndication think him the best, but 30/40's folk remembering Gillette on stage may well have thought Rathbone a travesty upon a great thesp who'd done the part 1300 times over a thirty year period and in a 1916 silent film since gone missing (don't use the word "lost" anymore: too hopeless). 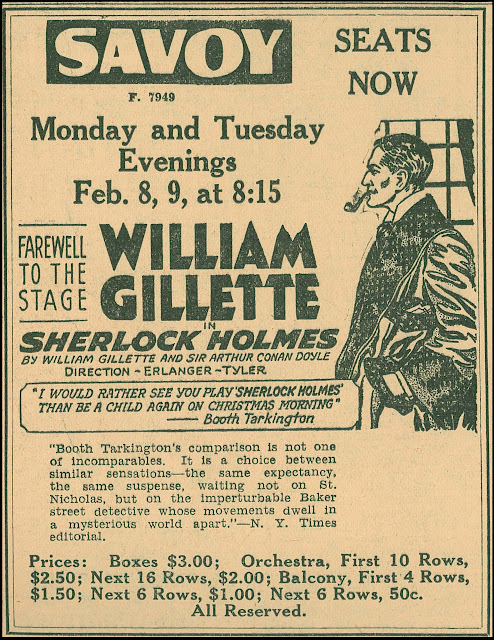 The ad here illustrates three of those 1300 Gillette occasions, a "farewell" to the stage (were there multiple such occasions?) and wow, look at the boost from Booth Tarkington, a stout man of letters not given to hyperboling: I Would Rather See You Play "Sherlock Holmes" Than Be A Child Again On Christmas Morning. Are there Holmes devotees among us today who would say the same? Gillette was for me not much beyond a legendary Holmes, but it turns out he was widely acclaimed for many a play written in addition to being performed by him. WG became something of a matinee idol as well, plus inventor and patent-holder for much stagecraft. We forget these titans of the stage on whose shoulders many a future movie star stood. How many of the latter looked at William Gillette for purpose to copy him later? 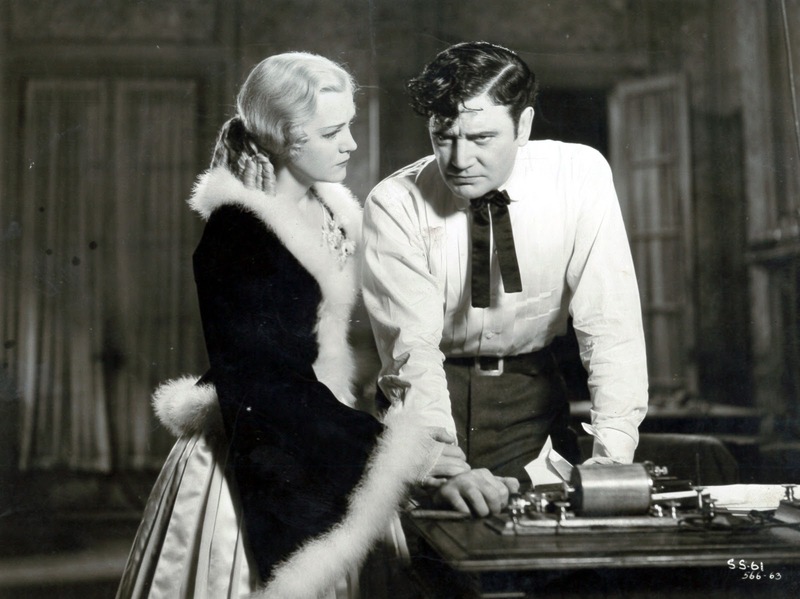 My further education got prompted by a TCM screening of Secret Service, a 1931 Radio Pictures adaptation of a Civil War romance writ by ... William Gillette, whose credits mention put me to search on how far back Secret Service went insofar as stage playing. 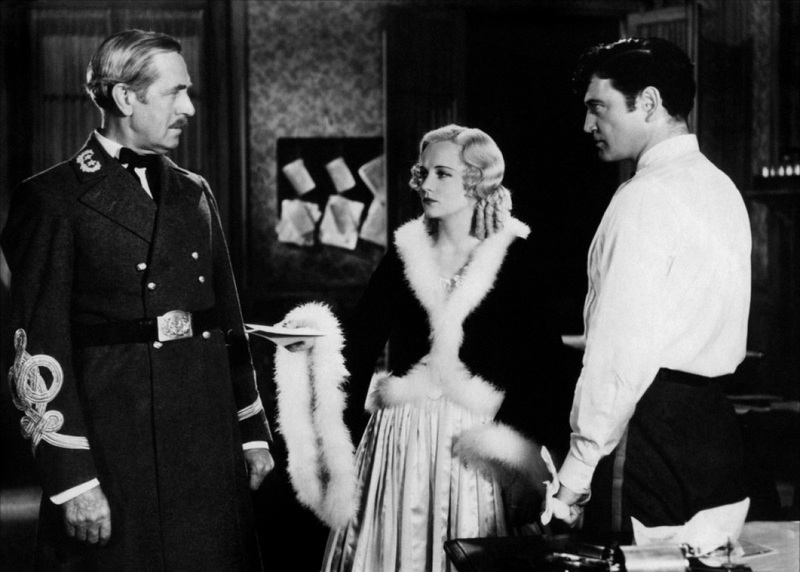 Turns out curtains rose first in 1895, with Maurice Barrymore, father of Lionel, John, and Ethel, in the lead taken by Richard Dix for the later movie. The thing was a smash and oft-revived right up to Radio buying rights. Gillette made the vehicle truly his own by assuming lead man role, the author/actor a draw near-equal to Barrymore. Secret Service dates woeful as a film, turgidity more RKO's fault than Gillette's. I'd love to see the play modern-enacted, but that'll happen when pigs fly. The set-up thus: Yankee Dix poses as Confederate officer to grease wheels for Richmond siege, falls for insipid crinoline-clad Shirley Grey, his mission compromised by love v. duty so often a stumble point for spies on either side, the Civil War being unique occasion where neighbors, brothers, and lovers wound up combating. What with the latter a rich resource of drama and doomed romance, was it a wonder Civil War themes resonated so in 19th and early 20th Century stage melodrama? And yet it tended to flop in movies past oodles of early pix by D.W. Griffith, Tom Ince, and like others. Did we need the passing of first-hand war witnesses to get Blue/Gray tints out of our blood? Anyway, Secret Service lost money. A negative cost of $250K saw $295K from domestic rentals, with only $56K foreign (what did they care about our Civil War?). Red ink amounted to $25,000. As to William Gillette essaying Secret Service, I'd be glad to venture back, but only after exhaust of revisited Christmas morns. TOO MUCH OF GOOD THINGS? --- I'm all for "Giant" Saturday shows, having sat through a few approaching that in the 60's, but none so exhausting as Steubenville, Ohio's five hour and forty minute rump-buster from 1958. Question is, what if any could you cull from all of these? Contemplate the bill: It! The Terror From Beyond Space was then-new and a good one, Curse Of The Faceless Man much less so. A 1:00 start time with King Kong and Mighty Joe Young in the lead would have set entertainment precedent hard to match, even by newest model sci-fi. Might a walkout part-way through Faceless Man have been in order? It comes down to one's own endurance for shows served continuous. My own limit is four, with lengthy meal break somewhere amongst the deluge. After a second and certainly by a third feature, the mind starts numbing. Would anyone today sit for a double-feature in a theatre, let alone four? (Remember what happened to Grindhouse) Parents once dumped young 'uns early on a Saturday with pick-up near dark, admission being more or less a warehouse fee. Again I'm drawn to late Kong/Joe Young bookings, so many of which occurred well after sale to TV and into the 60's, at least around my parts (they tended to play either kiddie shows or as "bonus" to a newer monster show, as here with Steubenville). Prints must have stayed in Charlotte exchanges right up to Janus Films leasing Kong in 3/66 for its own revival. LOUIS B. MAYER PRESENTS CINERAMA --- The above took place November 19, 1952. 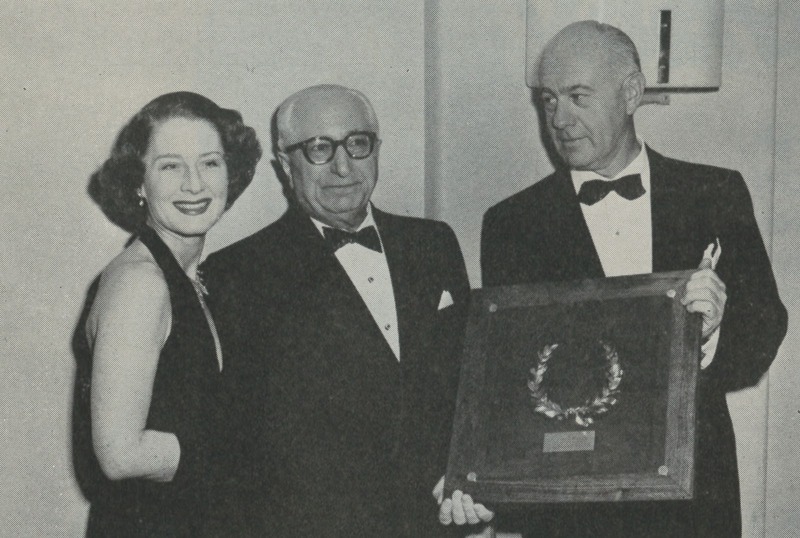 Lately deposed chief of MGM Louis Mayer was feted at a Screen Producers Guild dinner attended by seven hundred industry folk (producer Sol C. Siegel holding the plaque). Mayer's was called a "Milestone Award" for "major contributions" to Hollywood and its output. The Motion Picture Herald reported his look-back on old days and enthusiasm for Cinerama, for which company he'd serve as Chairman Of The Board. Entertainment was provided by M.C. George Jessel, who introduced Jack Benny, Bob Hope, George Burns, Lena Horne, and Ethel Merman. Longtime Mayer loyalist Arthur Freed, still at Metro but happier when L.B. ran it, produced the 11/19/52 tribute. The honored guest said movies were under siege by not just television, but night baseball, automobiles, and of all things, canasta. That last put me to wondering: Was canasta a serious rival to theatre attendance then? Must have been, or a seasoned observer like Mayer wouldn't have mentioned it. Do people still play canasta in such numbers? Norma Shearer was a decade out of pictures upon this occasion, but not reclusive. She'd turn out for events where other old-timers got recognized, and would remain a large Loew's stockholder. William Gillette is one of those folks who live on in popular culture thanks to a legacy that has nothing to do with the actual entertainment career - the fabulous Gillette Castle State Park in Connecticut has been a major tourist attraction for decades. (How many people viewing Colleen Moore's amazing fairy castle/doll house in Chicago's Museum of Science & Industry realize the odd little voice on the pre-recorded narration belonged to a silent movie star?) Hey, didn't Gillette get screen credit on ADVENTURES OF SHERLOCK HOLMES? I was the projectionist for a quadruple-feature of THE FLY, THE INCREDIBLE SHRINKING MAN, THE BLOB, and INVASION OF THE BODY SNATCHERS. They wanted a program title, so I gave them "Scream Gems." A nearby TV station ran Charlie Chan films on Sunday mornings in the '70s. They were scheduled to run "Charlie Chan in the Secret Service" one week; instead, they ran - you guessed it, the 1931 "Secret Service." PBS broadcast a new production of that Gillette play sometime in the late '70s. 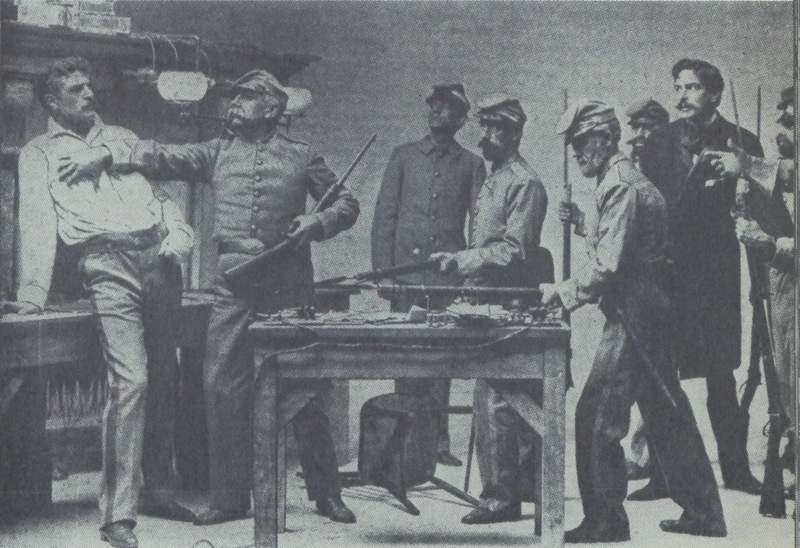 In-between acts, the cast sang Civil War-era songs. The John Barrymore silent was based on Gillette's play. It was lavish but not really fun, keeping some of the play's most awkward expedients and making Holmes a generic romantic lead. Saw a community stage version, which may or may not have been updated (there had been a big successful revival, and there usually is some tinkering on old shows expensively remounted). It was a bit talky and improbable, as Gillette had to maneuver a lot of characters, exposition and action into a series of single-scene acts. But it worked on an elevated melodrama level. The Fox film connection is interesting. Did they buy the play with the intention of doing it, or to simply block anyone else from buying it and producing a competing Holmes movie? Gillette was a method actor before Brando, shooting up cocaine on-stage when the play called for it. I tried watching Barrymore's "Sherlock Holmes" movie, but literally kept falling asleep. I sat through a quadruple bill of Marx Brothers MGM movies as a teenager. I couldn't do it again. Thanks to B-movies on TCM, my attention span has dropped to 70 minutes. I considered DVRing "Secret Service," then thought better of it, Civil War movies doing nothing for me. Looks like I made the right choice. I prefer Richard Dix in the Whistler movies, anyway. Just wanted to say thanks for the cute picture of Honor Blackman, one of the loveliest English actresses ever. I recently watched a clip from some comedy show she'd done in the U.K.---matter of fact, if might've been one the U.S. later ripped off---and notwithstanding I'm almost sure she's had a little 'work done' at some point, she looked fantastic in her 80s. In her 80s, mind you! Eegad. The woman's just an indestructible beauty. 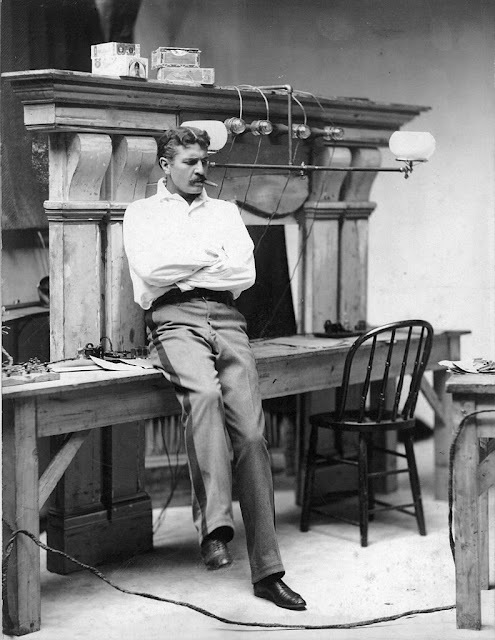 I simply wanted to say that with regard to your interesting facts about William Gillette, I think---I hope I'm not putting my foot in it---but I think I found at one time a website about Mark Twain which included a link to a recording Gillette made in which you hear him reminiscing about having been Twain's neighbor as a boy. He then states that he will attempt to 'do' Twain's voice to leave some record to posterity of how the great man sounded, and it is a very broad 'Suthen' accent that follows, indeed---and fascinating, of course, since I believe the blog or webpage states elsewhere that no other recording exists of Twain's actual voice nor anyone attempting to mimic it, as Gillette does here. My worry is that I'm substituting Gillette for some other famous stage actor, say, Richard Mansfield. These are only names for me, and this convinces me that even the movie notables of the past fifty years will one day soon join their ranks in obscurity! You've made similar observations about the silent stars, and they're quite sound, I think. You'd like to believe that like great painting, music, and literature, surely SOME movie names will endure 'forever', and some may. But...which ones? There's a street right across the freeway (U.S. 101) from where I sit typing this right now, a short residential street. I know its name will amuse you, because you---unlike probably well over 95% of current Americans (at least!) ---will recognize the name of the person it commemorates. It's called Laura LaPlante Drive! And yes, it is named after 'that' Laura LaPlante. Heaven knows how, or why. I don't know if she lived out here at one time, or if an admirer just named it after her. I also loved the marathon showing of "King Kong", "Mighty Joe Young", and those $1.98 shockers! Hilarious. I can tell you when I'D have walked out! Finally, it was nice to see a later picture of Norma Shearer, still a striking and classy-looking lady at the time. I recently saw a darned good online biography of the late Janet Leigh via which I found out that it was Shearer who saw Leigh's framed picture on the desk of a ski resort where Leigh's father worked (whose name was not Leigh, and I can't remember her actual last name---I'm going to let myself off from jumping to the IMDB to remind myself.) This was in or around 1947. Anyway, Shearer was apparently so taken by the youngster's beauty that she, acting on her own impulse, arranged to have the girl brought to MGM for a screen test! I thought that was very generous, especially for a woman who'd been a big star herself. And Leigh went from obscurity to a starring role in an MGM film, "The Romance of Ruby Ridge" I think it was called.